China has carried out aircraft carrier drills in the Pacific, its navy said Saturday, ramping up tensions with Taiwan over its military exercises in the sensitive region. Beijing's sole aircraft carrier and two destroyer ships carried out "offensive and defensive drills to test their combat muscle" on Friday, China's navy said on its official microblog site on Weibo. The exercises took place in an area east of the Bashi Channel, which runs between Taiwan and the Philippines, it said. China sees democratically-governed Taiwan as a renegade part of its territory to be brought back into the fold and has not ruled out reunification by force. 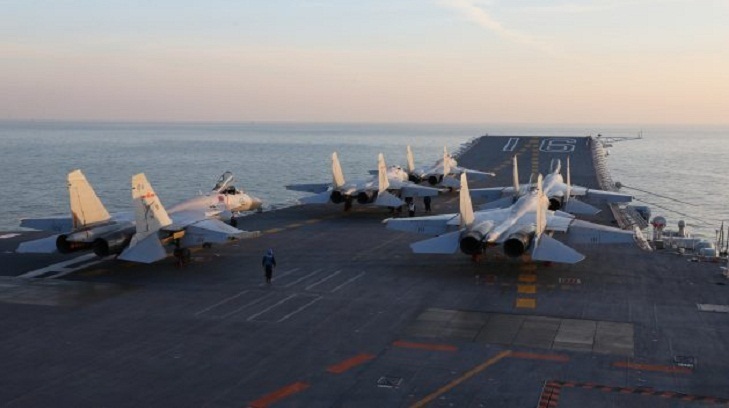 In Beijing's latest military drills, photos showed J-15 fighters waiting to take off from the Liaoning aircraft carrier. The Jinan and Changchun destroyer ships also participated in the training. Taiwan has accused China of "saber rattling" after Chinese bombers and spy planes flew around Taiwan Thursday, and the Chinese navy conducted live-fire drills off the Taiwan Strait a day earlier. "China has deliberately manipulated (the exercise) to pressure and harass Taiwan in an attempt to spark tensions between the two sides and in the region," Chiu Chui-cheng of Taiwan's Mainland Affairs Council told a regular briefing Thursday. "(We) will never bow down to any military threat and incentive." Beijing has stepped up military patrols around Taiwan and used diplomatic pressure to isolate it internationally since pro-independence President Tsai Ing-wen took office. Chinese President Xi Jinping observed the navy's largest-ever military display this month in the South China Sea, which involved 76 fighter jets and a flotilla of 48 warships and submarines. Beijing has also been angered by Washington's arms sales to Taipei, and China protested last month after President Donald Trump signed a bill allowing top-level US officials to travel to Taiwan. Washington switched diplomatic recognition from Taiwan to China in 1979 but maintains trade relations with the island.